Although today the Glen Iris Inn is just one of the many attractions of Letchworth State Park, for those who love the history of the Park, it is the most special of places. For it is at the Glen Iris, surrounded by the mist and roar of the Middle Falls, that you can most easily step back into the past and feel the presence of William Pryor Letchworth. The story of the Glen Iris Inn does not begin with Mr. Letchworth, however. To find the beginning we must reach back nearly two centuries, back to the pioneer days in the Genesee Valley. James Monroe was the President of the United States when Alvah Palmer came to the small terrace of land overlooking the Portage Falls. With the help of his family he built a mill on the Middle Falls and farmed the flat lands to the south of a little cabin he had built with his own hands. It was a rugged, but beautiful place to carve a living out of the new land. The Palmer's were successful enough to enlarge the log cabin into a small two-story house. Around 1832 a man named Michael Smith and his family arrived in the Valley. Smith was an immigrant who had once served in Napoleon's army. He became interested in the Palmer property, but not just for the farm and mill. The Falls would eventually bring tourists, and tourists would bring a good living to him and his family. So with a business partner, Theodore Olcott, he purchased the land for $5.50 an acre. 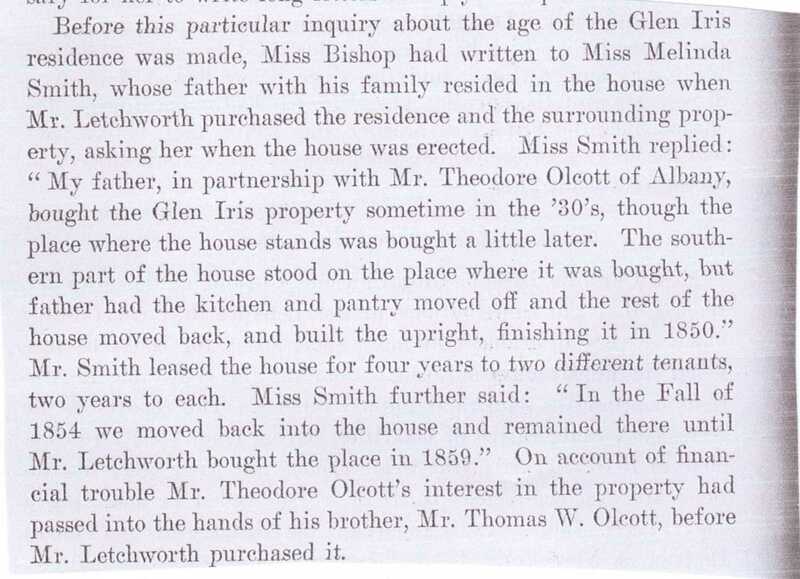 Years later, when Mr. Letchworth owned the property, his secretary wrote the Smith family in the hopes of finding out more about the early history of the Glen Iris. The following is an account of that correspondence as found on page 96 of the 22nd annual report of the American Scenic and Historic Preservation Society in 1917. It might of been one of Smith's tenants who operated a "temperance tavern" that was called the Cataract House. According to account Michael Smith also had financial problems which led him to sell the property to the Buffalo businessman, William Pryor Letchworth. Letchworth was looking for a place to get away from city life and pursue his interest in art, literature, and nature. Viewing Smith's property from the deck of the Portage High Bridge, Letchworth knew that, if the price was right, he had found the perfect place. It was. Letchworth was able to purchase the entire property in 1859. He paid Smith $1.00 for it, for Smith by this time was heavily mortgaged to his former business partner, Theodore Olcott. Olcott got the remainder of the money - $7000 in all. The former Cataract House was now in new hands.It was on the Fourth of July of that same year when Letchworth stayed at his new country home for the first time. The house and the surrounding countryside must have seemed wild and rugged to the young businessmen and his Buffalo friends who accompanied him on this first adventure, but Letchworth knew he had done the right thing. Immediately he laid the plans for what would become the Glen Iris Estate. Work would have to be done on the old Cataract House. It would no longer be an Inn or Tavern, but his home and headquarters for the estate. Although Letchworth's tastes were not extravagant, he did want a certain level of comfort for himself and his guests. Suitable arrangements would have to be made for his growing art collection, along with shelves for his extensive library and cabinets for his future collection of natural and historic curiosities. By the time he had hired a landscape architect to lay out the rest of his estate, the Glen Iris and nearby barns and buildings had already undergone extensive renovations. The architect, a man named William Webster who had studied under Frederick Law Olmstead, tried to talk Letchworth into letting him tear down the older structure and build a more stately home on the flat land to the South, farther away from the main gates. But Letchworth had objected, leaving Webster no choice "but to let (it) remain for the present." (See Ornamental Farm). Despite these problems, Letchworth still chose to give his beloved Glen Iris Estate to the State of New York in 1907. The deed reserved for him life use of the Glen Iris and the grounds, and so he lived out the remaining years of his life in his "cottage" overlooking the Middle Falls. In the evening of December 1, 1910, William Pryor Letchworth passed away peacefully in his bedroom at the Glen Iris. For a few years it was unclear what role the Glen Iris would play in the new Park. At first it served as the Park "headquarters" and was maintained, just as Mr. Letchworth left it by his secretary, Caroline Bishop. But the Letchworth Park Committee, which ran the Park, quickly realized that the Glen Iris could also serve as an Inn for the growing number of tourists who were coming to the new Park. Michael Smith's old dream of a prosperous Inn overlooking the Middle Falls was reborn. At first a housekeeper was hired at $50.00 per month who could provide meals for guests at $.75 (at her own expense) and charge another $.75 for a night's lodging. These early visitors truly felt as if they were Mr. Letchworth's personal guests - they actually ate at his table and slept in his beds. Letchworth's furniture, library, and collections of art and history all remained intact for the visitor's enjoyment. Although the Glen Iris is now a commercially run Inn within one of the most popular State Parks in the East, it is still a place to enjoy and experience as much for its place in history as for its hospitality and fine dining. It is the place that is central to the long history of Letchworth Park, and it is there that one can still sense the loving hand of the Park's benefactor, William Pryor Letchworth.